In the last post, I shared with you some useful tips for creating a powerful scarcity marketing plan for your business. If you missed that post, I encourage you to check it out, or just bookmark it to read later. You’ll find the link here. 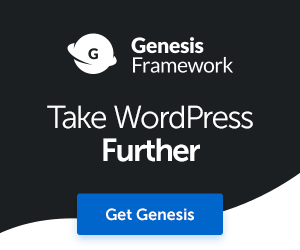 So in this post, I’m going to introduce to you a powerful and possibly useful WordPress plugin. This is a plugin designed to help you create the most impactful scarcity marketing campaigns for your business. The plugin is called Thrive Ultimatum. You may have actually seen it already. If not then read on. Thrive Ultimatum is the complete scarcity marketing multiple-campaign builder plugin, with built-in templates, simple campaign tracking tools, a host of mind-blowing features and much more. Thrive Ultimatum was created by the amazing team over at Thrive Themes. Yes, I know what you’re thinking, yet another Thrive product launch, yet another Thrive product review from me! As you know I love Thrive and everything they do, but most importantly what they stand for. So yes, this is another Thrive product review, and I think this one is just as exciting as all the other products we’ve seen so far. As usual, Shane MeLaugh (Co-Founder of Thrive Themes) and the company has not left us disappointed with Thrive Ultimatum. But the question is, is this going to REALLY be of any use to anyone? If you are familiar with Thrive Themes, you’ll appreciate all the awesome stuff that we’ve seen come out of this company in recent years. And many more… And so now we have Thrive Ultimatum. If you are not familiar with Thrive Themes, I recommend you check out their website and learn more about what these guys are doing, and how they can help you boost your online conversions. So back to this tool for now. Before you decide whether this tool will benefit you and your internet business in any way, let’s dive deeper. I don’t know about you but I’m a sucker for features when it comes to online tools. So here’s a massive list of features that comes with the Thrive Ultimatum plugin. 1. Fixed date campaigns – If you want to run your scarcity marketing campaigns on certain dates, with fixed date campaigns you can do just that. You simply set the start and end date and let the plugin do its magic. 2. Recurring campaigns – With recurring campaigns you can set Thrive Ultimatum to automatically start, stop and repeat campaigns for you. You don’t need to set an alarm or reminder to end your campaigns. 3. 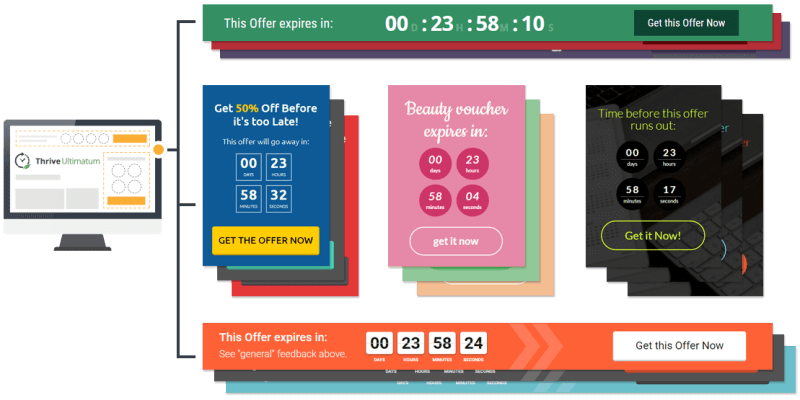 Evergreen campaigns – I love this type of campaign, and it’s one where you can let each new person that visit’s your website or blog, experience their own time limit for an offer before it expires. 4. Multiple-page campaigns – If you want to run campaigns across multiple pages on your blog, perhaps you want to create some targeted offers on specific pages, you can easily do so with Thrive Ultimatum. 5. Autopilot – Automatically set your campaigns to switch sales page links and buy now buttons when they expire. All without having to change them manually yourself, huge time saver. 6. 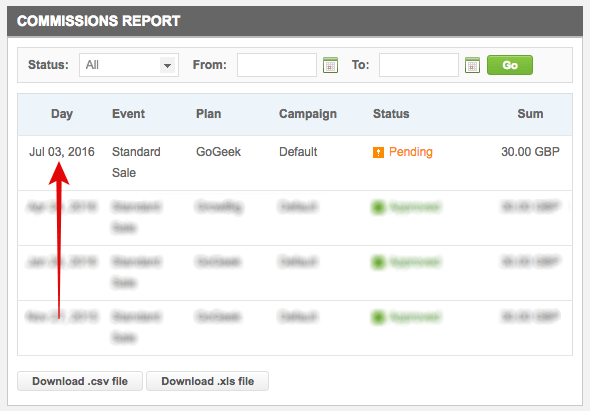 Unlimited campaigns – Create and run multiple campaigns without breaking a sweat. So those are some of the key features of this plugin. Have you decided whether any of them will be beneficial to your business yet? If you have, you can learn more about them in greater detail here. 7. 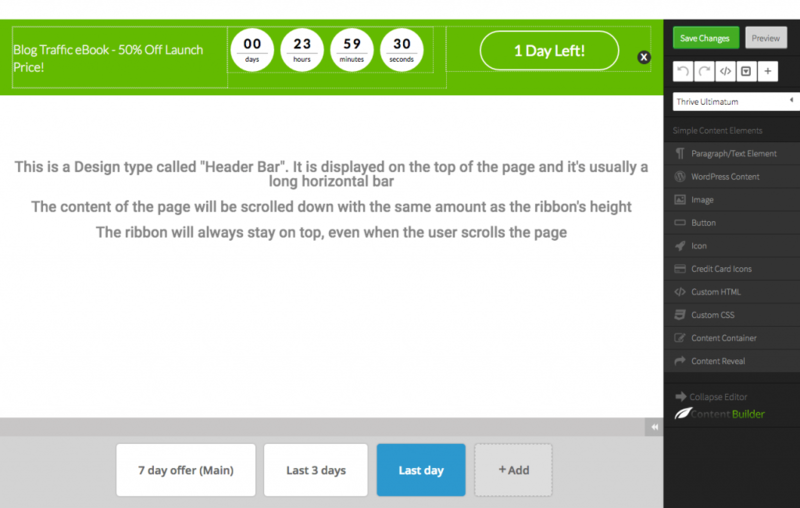 Countdown widgets – Exceptionally useful if you want to add a countdown widget to your site for one of your offers. This widget can go anywhere on your site, including top or bottom, floating footer bar etc. 9. Dynamic updates – Throughout your campaigns, you can automatically set changes to take place to the design and display of your countdowns. This gives you complete freedom to customize the design and layout of your campaigns just the way you want. 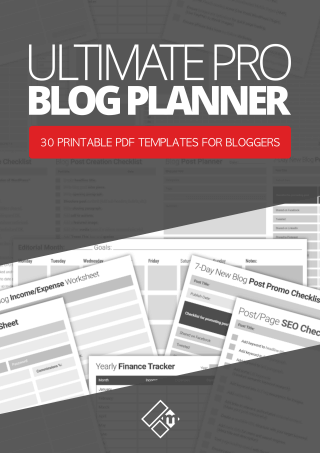 Or you can save time and use one of the many available pre-designed templates that come with the plugin. 11. 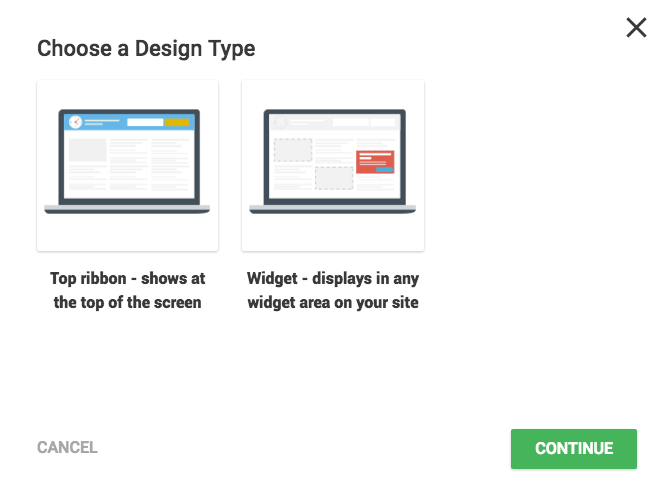 Display options – You decide where your campaigns should or shouldn’t be displayed on your WordPress blog or website. 12. Mobile responsive – Yep, your campaigns will still look super-slick on all mobile devices! Even with the recent new Google algorithm updates made to mobile displays, Thrive Ultimatum won’t get you slapped for covering up content on mobile devices. 13. End your campaigns automatically – Once your customer has made a purchase through your time-sensitive campaign, you can automatically stop showing the countdown to that individual customer. Smart stuff right? 14. Boost conversions with new campaigns – Want to take your customer to the next conversion goal? Thrive Ultimatum will help you do just that. 15. Dynamic redirect links – Meaning you can create single links that will redirect any visitor to a ‘sales page’ or a ‘coming soon page’ or another page entirely. 16. 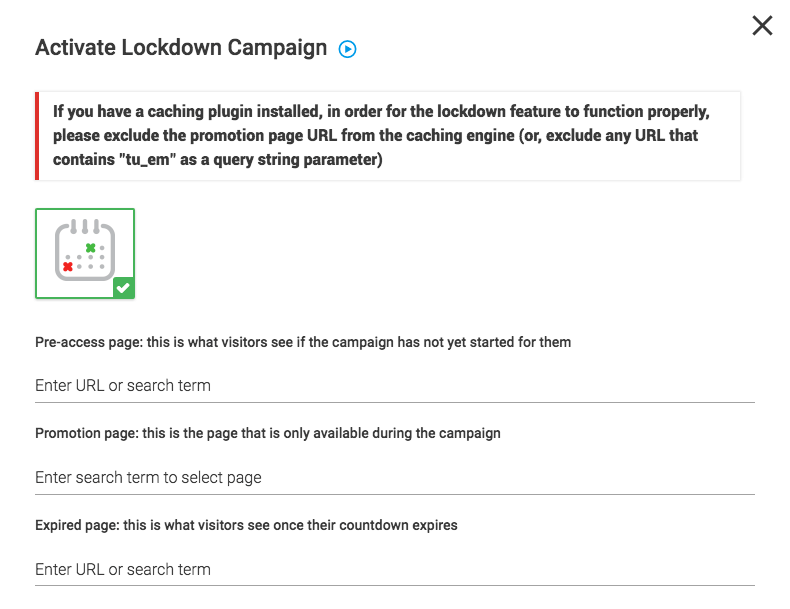 Lockdown feature – Create offer campaigns that can’t be cheated or back-doored with the ‘lockdown feature’. Create custom pages and add the URL’s in your lockdown settings. 17. Email links – Want to convert your email list members into paying customers? Well you can, because with Thrive Ultimatum you can create and send links to your list members that will automatically kick-start your evergreen campaigns when they click on the link. 18. Simple but powerful daily impressions graph – To help you fine-tune your campaigns and compare them against each other. In addition to this huge list of features, as usual with all Thrive products you get unrivaled customer support, training and useful tutorials as a Thrive Member. Who would benefit from using Thrive Ultimatum? OK so now the fun part. 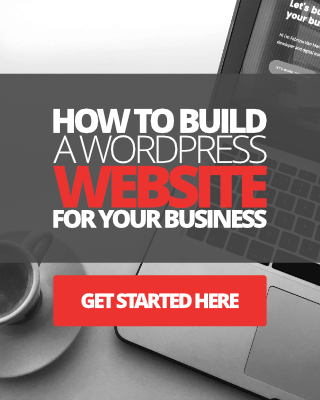 Whether you offer your own digital products or services that you want to boost sales on, or you’re an affiliate for a company that is running a time-sensitive offer on their website, this tool could prove to be super useful for you. As an affiliate imagine this. It’s Black Friday and there’s a bunch of amazing offers going on with products and services you promote as an affiliate. By creating some fixed-date campaigns, you can target specific audiences on your site for each offer. Perhaps you have a bunch of book reviews on your site. Well, you could create targeted time-sensitive offers for each of those books if there’s an offer going on. 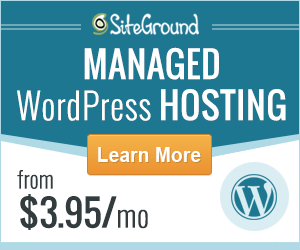 Perhaps your web host or theme provider is running a special time-sensitive promotion! You could use Thrive Ultimatum to target specific audiences for those offers, making them display in targeted content pages and posts on your site. 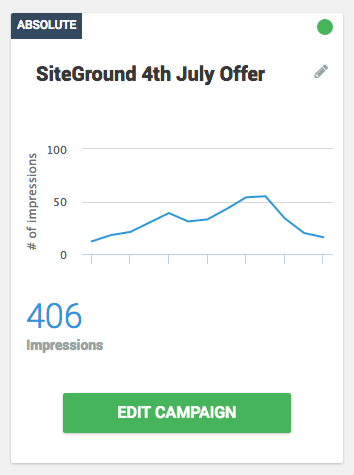 Recently I used Thrive Ultimatum to promote a time-sensitive 4th July offer from my web host provider SiteGround, and although the campaign only ran for a few days, I was able to bag one affiliate sale. I realise that this is far from impressive, but I’m merely showing you how useful this plugin could be to help you boost your own affiliate sales too, especially for high traffic sites. Here’s another scenario; Perhaps you’re about to launch a brand new eBook and want to create a special 7-day 50% off offer to your visitors. You could create a fixed date or even an evergreen campaign to make your offer unique to each of your blog visitor, and profit even more for a longer period of time. The possibilities are endless and Thrive Ultimatum could be the key you’re looking for to help you increase your sales conversion, or even boost email conversions quickly. How to use Thrive Ultimatum? Using this plugin is pretty simple as with most of Thrive products. Do check out the short 12-minute video I put together below. 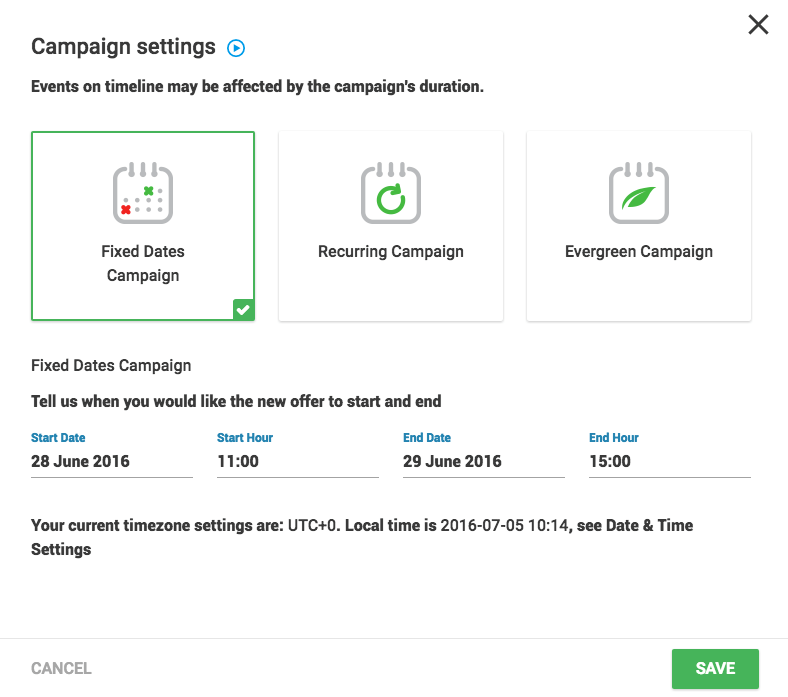 It shows how to create a simple fixed-date campaign in Thrive Ultimatum. How much does Thrive Ultimatum cost? Now we get down to costs. To use Thrive Ultimatum on a single website, you’ll have to dish out $127. To use Thrive Ultimatum on unlimited websites or blogs, you’ll have to dish out $197. My thoughts on price are that this is quite expensive for a WordPress plugin. Seriously, I love Thrive and I know this comes with a ton of features. But $127???? The other option you have is to become a Thrive Member and get access to not only Thrive Ultimatum, but all the other Thrive products as well. Membership costs $19 per month if you’re an individual, or $49 per month if you’re an agency or a web designer. The Thrive Membership is definitely a more cost-effective option I think. Pros? Well, that’s easy. Lots of amazing built-in features, tools and ultimately the only powerful scarcity marketing plugin of it’s kind on the market. Cons? None technically. However, price wise for a single license could be considered quite steep. I think it is in any case. Perhaps a more sensible price for a WordPress plugin of this kind would be $67 or so. That being said, Thrive Ultimatum is quite a unique product. And if there are any other similar plugins out there, I can’t imagine they offer as many built-in features as this one. I’ve tried to be as honest as possible in this review. The plugin has a lot of potentials and could prove to be very useful to marketers. You get lot’s of awesome features, ease of use and incredible support as always with Thrive. I’m still exploring some of the capabilities of Thrive Ultimatum myself. I recently used this plugin to launch my new traffic strategy eBook with some success, and as I’ve said I’ve also used it lightly to promote a recent affiliate offer. I would encourage you to at least watch the video Shane MeLaugh has put together on this page, to get a better insight into scarcity marketing and how this plugin could benefit you and your business. Whether you think your business needs Thrive Ultimatum I’ll leave you to decide that one. I give it a huge thumbs up personally, and I’m looking forward to using it more in the future.